How many bones in the human body? It's not what you think. If somebody asks you how many bones there are in a human body, please do not blurt out, “206.” The correct answer is nuanced. To respond accurately to the query, you have to address five questions. Who? What? When? Where? Why? Consider first that humans vary from one another in facial features, hair color, height, and shoe size. Unknown to nearly everybody except anatomists, surgeons, and radiologists, variety continues beneath the skin. Nerves, tendons, arteries all have their unique features, and their precise arrangement in me says little about their precise arrangements in you. True, you can generalize and be right most of the time when you say two eyes, one heart, ten toes, and 206 bones, but then the subtleties kick in. Therefore let’s answer the who-what-why-when-where queries. Who is counting? A paleontologist brushing sand off long-buried fossils may miss some tiny bones that make work interesting for hand and foot surgeons. 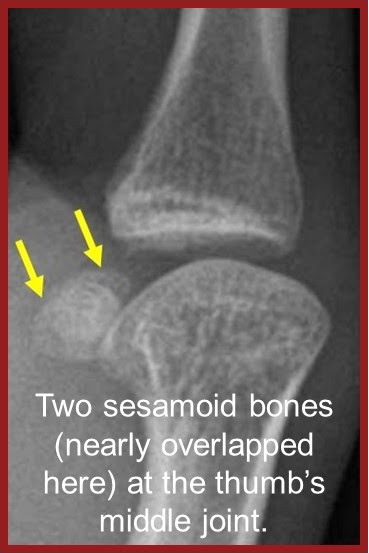 These bones are called sesamoids because they reminded somebody of sesame seeds. In humans, they are larger than that, more the size of capers, but sesamoid sounds better than caperoid. Sesamoids help to distribute pressure evenly as we grip and walk. Some people have none, and they manage as well those folk who have 20. Consequently, we call them accessories. You may want to include at least some of them in your count. What counts as a bone? 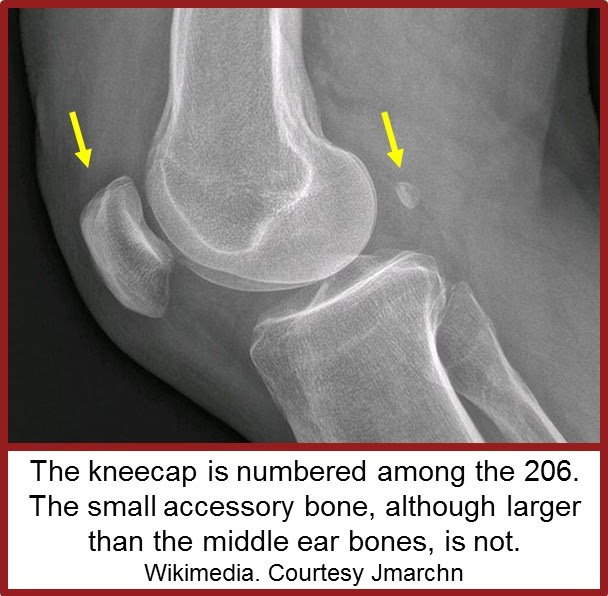 The knee cap is a giant sesamoid, and it is always included in the favored 206. So is a pea-sized one in the wrist. Most people have 12 ribs on each side. Those with 14 do not get any extra credit. Three tiny bones in each ear count. Sesamoids in the feet are left out as are bean-sized accessory bones around the hip, knee, and ankle. When do we count? Babies start out with perhaps 270 bones, and some fuse to one another during growth. At birth, for instance, the plate-like skull bones can move against one another and shift the head’s shape to facilitate delivery. Then as a normal occurrence, the interdigitations between the skull bones gradually become rigid and may eventually fuse to one another to fully protect the resident Sparks Family. Also, certain bones in the wrist and ankle that usually remain separate sometimes make themselves one with a neighbor despite the rules. Where do we look? An X-ray in infancy is not going to show anywhere near 270 bones, because many of them do not yet contain enough calcium to block X-ray beams and make shadows. For example, if you trusted an X-ray, a newborn’s wrist would not have any bones in it at all.